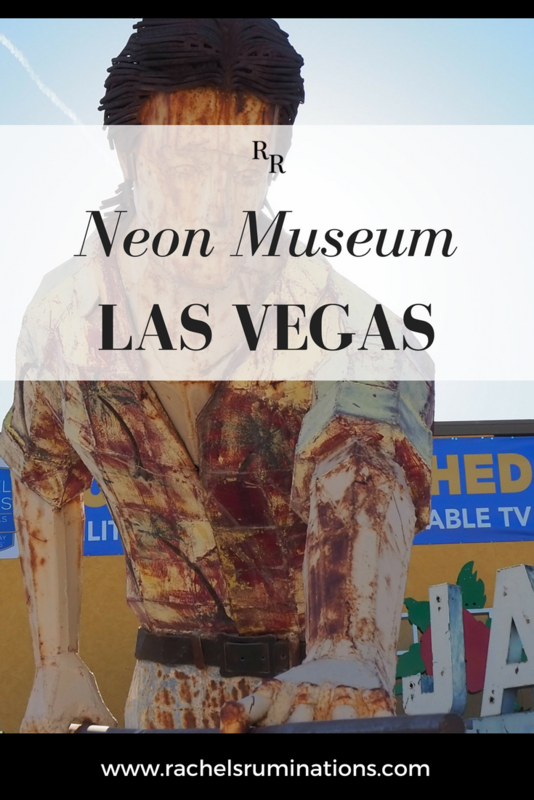 The Neon Museum Las Vegas isn’t like any museum I’ve visited before. It has more in common with a junkyard, albeit a very tidy junkyard. 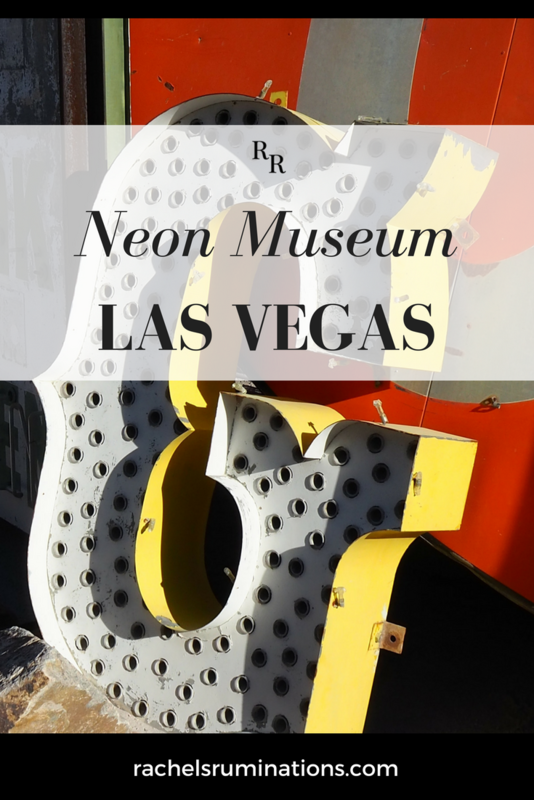 The sign for the Neon Museum Las Vegas is made up of several of the common Las Vegas sign fonts. The neon tubes are broken. The sockets gape, empty of their incandescent bulbs or sporting shards of glass. The faded vintage signs lean or lie several layers deep along the cleared paths that wind through the yard. In the desert glare, it’s a melancholy sight. 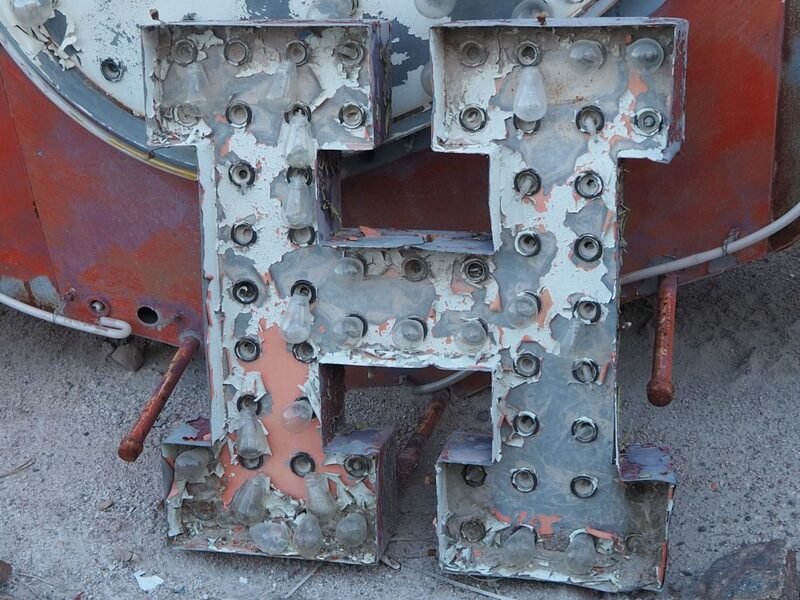 Many single letters litter the Neon Museum Las Vegas. In Las Vegas’s heyday, the motels and casinos that popped up in the Nevada desert needed to stand out. Bright signs, each one handmade from neon tubes, incandescent bulbs, or both, were expensive. Instead of buying them, the businesses leased their signs from the companies that made them. 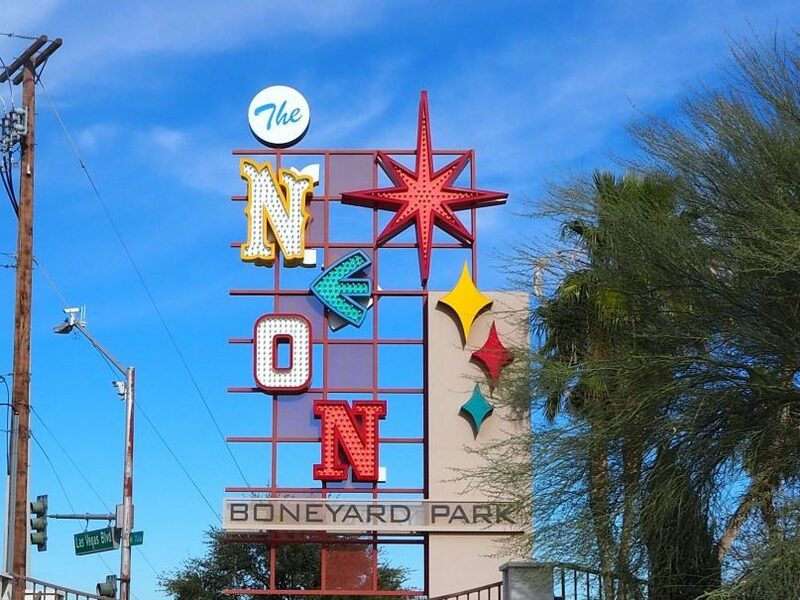 When they went out of business, or upgraded to a new, bigger, louder sign, the old signs ended up in their manufacturer’s “boneyard.” Scavenged for parts for newer signs, they deteriorated in the desert sun. A motel sign that has seen better days. 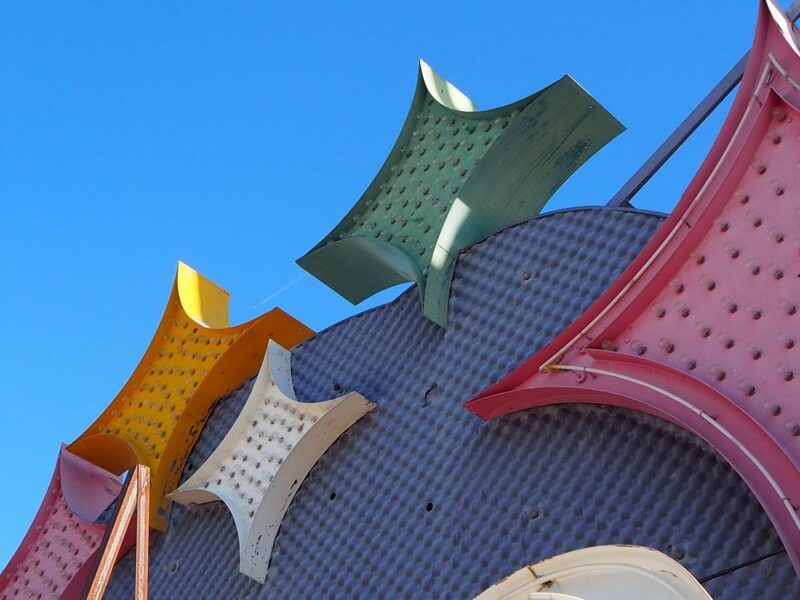 The Neon Museum is on a mission to collect Las Vegas signs and restore them to their former glory. So far, 11 of the signs at the museum are operational. Nine more have been installed along Las Vegas Boulevard as part of a long-term project. Some of the signs in the “boneyard” are familiar, like the Stardust sign that, our tour guide explained, uses Atomic font. Apparently, anything atomic-bomb-related was popular in the 1950s, when people would travel to Nevada to watch the nuclear bomb tests in the desert. The sign from the Stardust Resort and Casino. Most of the signs – or single letters that used to be part of signs – are very large. They weren’t intended to be viewed from close up; they would have been mounted high on buildings or poles and visible from long distances. From nearby, they seem rough, crudely made, but precision in form wasn’t necessary. As our tour guide steamed through his spiel – he packed an amazing amount of detail into an hour-long non-stop story – I ventured as far as I dared from the group, trying to get pictures without people. Visitors are not allowed to wander the yard alone because of the dangers posed by the broken glass of old light bulbs and the rusty edges of the signs. You might also like Musée Mécanique and its Penny Arcade Machines, Kitsch and Karaoke at ABBA the Museum or The Communist Consumers Museum. The building housing the museum’s reception and gift shop is a sight in itself. 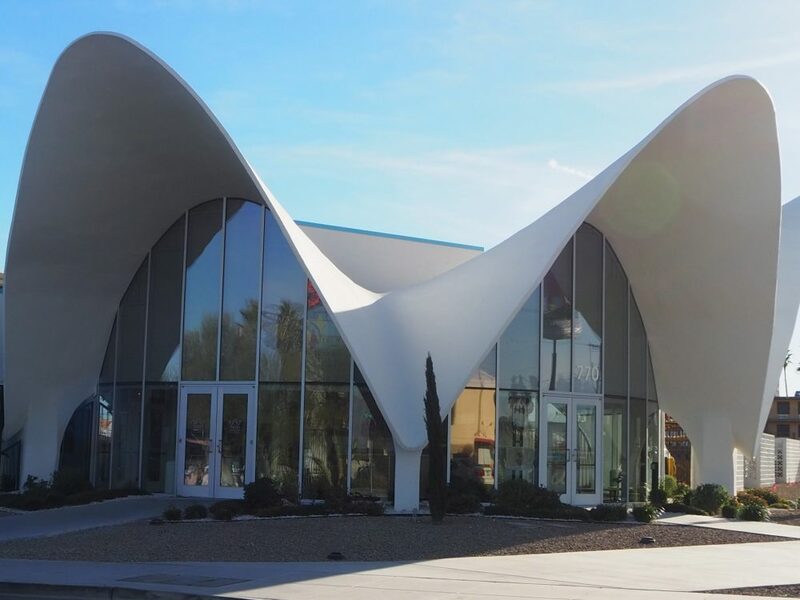 Once the lobby of the La Concha Motel, built in 1961, the curved lines of its roof reflect the “space age” futuristic tastes of the “Googie” style. The giftshop, by the way, has some fun and unusual gift items. 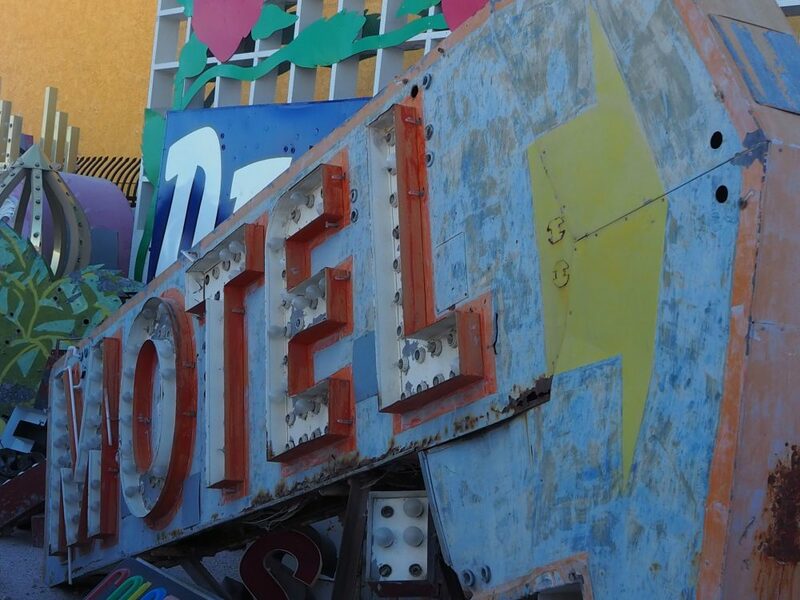 The La Concha Motel’s reception now serves as the reception of the Neon Museum. The signs in the “boneyard” evoke a certain nostalgia for a time of wild, optimistic growth. Las Vegas still thrives on that optimism, drawing millions every year to try their luck at gambling. 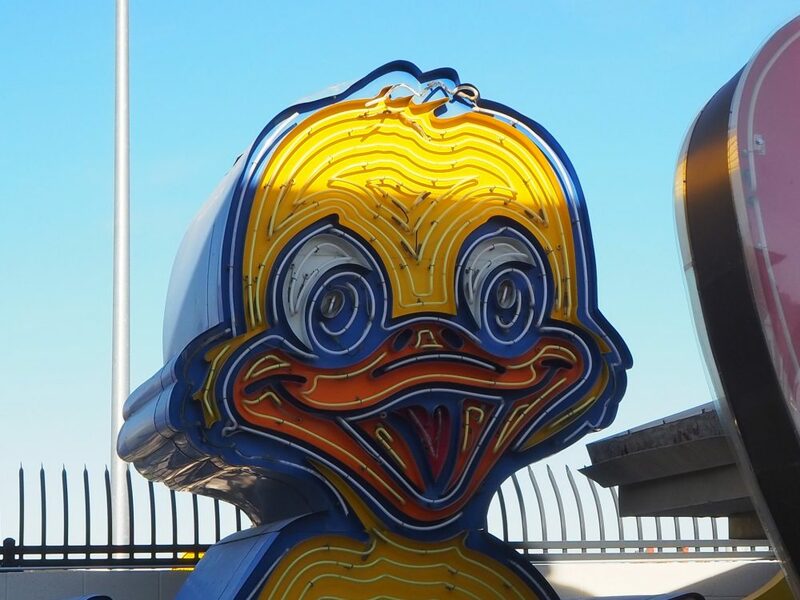 And over-the-top neon signs are still produced and still beckon from casinos and hotels all over town. 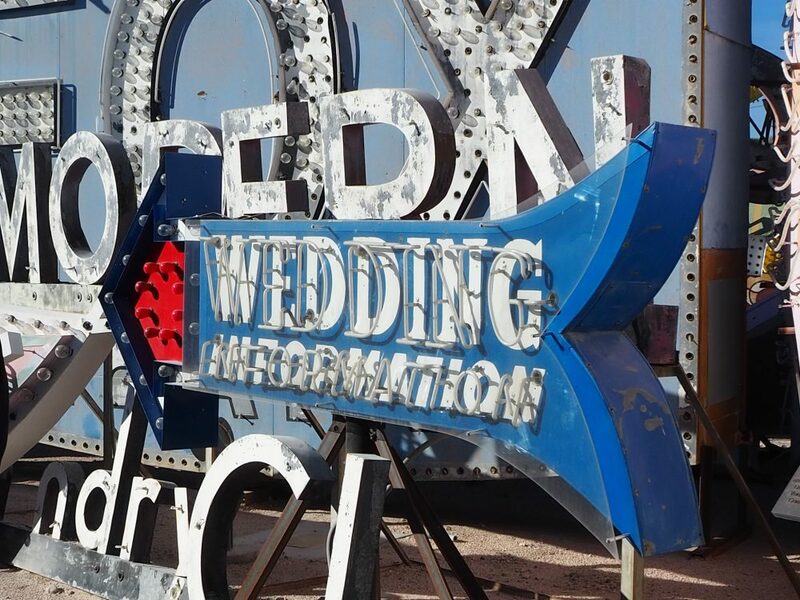 One of the more ornate signs in the Neon Boneyard. 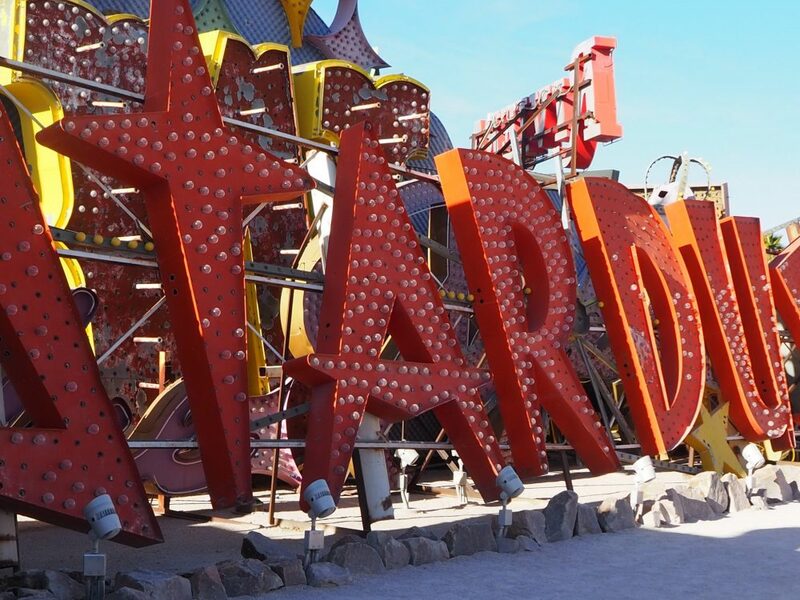 Yet there’s a brashness to these old ones – the Neon Museum has signs dating as far back as the 1930s – that made me smile. In the post-war period, they promised riches, or they fed into America’s love affair with the road trip. Motels and diners catered to the new middle class, who owned a car and could hit the road, looking for adventure. Las Vegas was the place to get rich, get married, drink, and generally enjoy their new prosperity. Even though I never visited Las Vegas in its heyday – I was just a child at the time – I recognized many of the signs. I could pick out the font from Caesar’s Palace, for example, and lettering from Circus Circus. From old movies perhaps? I’m not sure. In any case, it’s a nostalgia for something I never actually experienced myself. My daughter, in her mid-20s, recognized little of it. Yet, as a graphic designer, she found the fonts and signage interesting and could enjoy the vintage feel of the place. 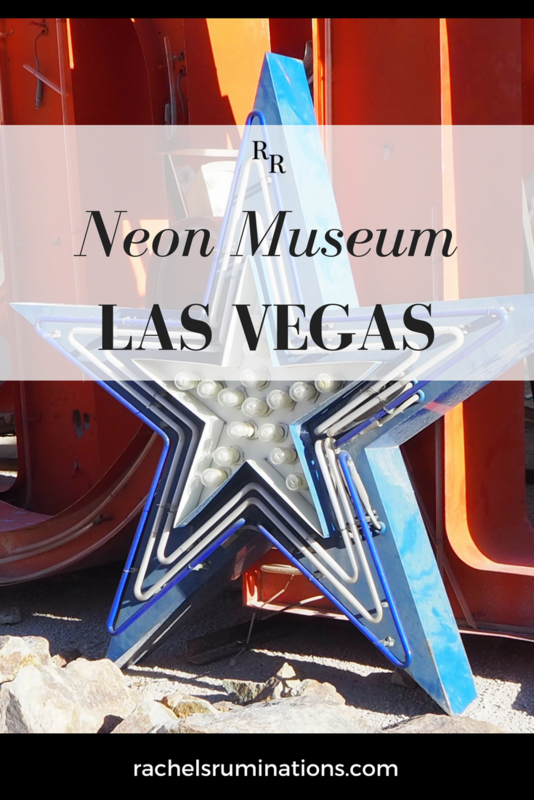 The Neon Museum, 770 Las Vegas Blvd. North, Las Vegas. Opening hours vary. Book a tour through their website or just show up (as we did) and there might be room on a one-hour tour. Tours may be cancelled in bad weather. Day tours: $19; Night tours $26; Late night tours $28. 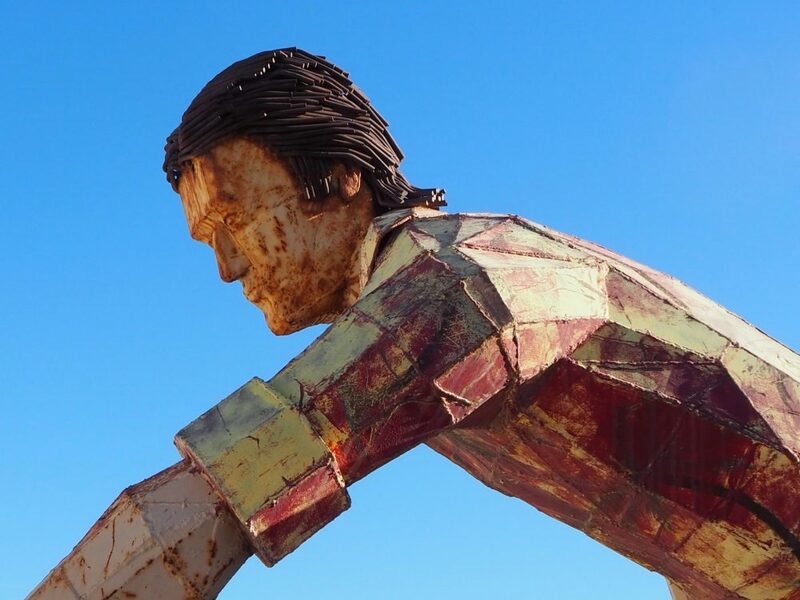 We had actually seen an article about the Neon Museum (Boneyard) not too long ago. It seemed interesting to us, and thought that we would like a visit when in Vegas. Thanks for keeping our interest piqued with all of the colorful pics, and great article. It’s definitely worth seeing! Thanks for stopping by! We’ve had that on ‘our list’ for ever and still haven’t made it there. Loved the tour you gave us! This is the kind of place I love exploring- even though you can’t walk around by yourself. What a fabulous idea to utilise the old signs. Eventually a whole series of them will extend along one of the main streets for miles. But they cost a lot to restore, so it’s a long process. This looks like a place I would definitely like to visit. I love the kitsch and uniqueness of it – great photos! I think Vegas is fun if you are in the right frame of mind. My daughter had just finished her masters and needed to de-stress, so it seemed like the easiest place to go for a few days. This museum was the most intellectual thing we did the whole time we were there. We had a ball! Those signs are amazing! This has bumped to the top of my “reasons to visit Vegas again” list. I’ve been to Vegas a few years ago and had never even heard of it. I’m not sure I’d make a special trip for it, but it’s worth a stop if you’re there! I had the opportunity to visit this museum last year and liked it a lot (even if it was super hot). I have been living in Los Angeles for 15 years and have been visiting Vegas for the same period of time. I didn’t get to see the “Old Vegas” but I have seen how the city has changed through the years. What we have today it totally different from what I experienced years ago. As an example, years ago Vegas had a high season and a low season. There is no such a thing nowadays.